Donna Yoshitake Wuest has been a professional writer/author for more than 40 years. Born in Vernon, BC, she grew up on the Coldstream Ranch where her parents worked primarily in the orchards. Decades after moving away from the ranch, she researched and wrote Coldstream The Ranch Where It All Began (published by Harbour Publishing). 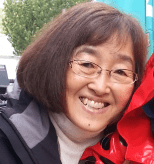 She also wrote Wild Birds: Carvings by Tad Yesaki; Photographs by Roy Hamaguchi in conjunction with the Japanese Canadian National Museum; and has been working as a business journalist and freelance business writer in BC and Alberta. In addition, she is currently writing another ranch book and novels.